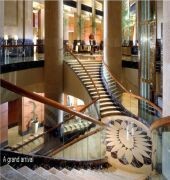 The hotel is located in the Central Business District, The Fullerton Hotel Singapore is a 5-minute drive from Clarke Quay and Boat Quay. It features a spa, infinity pool and 24-hour fitness centre. The Fullerton Hotel Singapore is a 25-minute drive from Changi International Airport. Raffles Place MRT Station is a short 5-minute walk from the hotel. Each room at Fullerton is equipped with a flat-screen TV and free wired internet or Wi-Fi. A minibar and tea/coffee maker can be found in all rooms. Guests can indulge in spa treatments at The Asian Spa or work at the 24-hour business centre. Hotel Fullerton also houses various luxury boutiques on site. 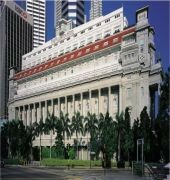 The FULLERTON HOTEL SINGAPORE is a Business, Heritage Building, City hotel hotel. Located in City Centre-Raffles City business district area. Shopping is within walking distance and the nightlife/restaurants are located in the hotel. 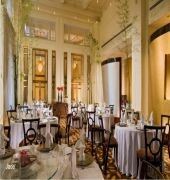 Descriptionclass="small" style="text-align: justify; font-size:11px;">The hotel is located in the Central Business District, The Fullerton Hotel Singapore is a 5-minute drive from Clarke Quay and Boat Quay. It features a spa, infinity pool and 24-hour fitness centre. 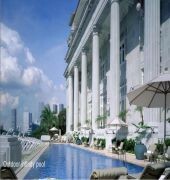 The Fullerton Hotel Singapore is a 25-minute drive from Changi International Airport. Raffles Place MRT Station is a short 5-minute walk from the hotel. Each room at Fullerton is equipped with a flat-screen TV and free wired internet or Wi-Fi. A minibar and tea/coffee maker can be found in all rooms. Guests can indulge in spa treatments at The Asian Spa or work at the 24-hour business centre. Hotel Fullerton also houses various luxury boutiques on site. 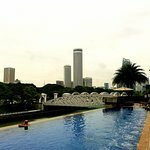 My wife and I stayed at The Fullerton Hotel for 2 nights in March 2019. Hotel is centrally located near the water front. Very nice room we stayed in. There is a nice pool and gym as well. We did not dine at the hotel as we ate out at local restaurants. Overall, we enjoyed our stay and will stay here again in the future. Thank you for your lovely review. We are delighted to receive your feedback and we truly appreciate your kind compliments on the hotel. We look forward to welcoming you back in the not too distant future. The Fullerton exceeded our expectations. Beautiful hotel and staff. If you can afford a Club room worth every penny. We had a room overlooking the Marina no balcony but stunning views. We could chose whether to have breakfast in the club or downstairs over looking the river. Outside by the river is recommended and although in the centre of the city so quiet. The infinity pool is on the 2nd floor and well worth a swim, again amazing views and service. All the staff were excellent and friendly. The butlers in the club especially Paulo exceptional nothing was too much trouble. The concierge was efficient arranging a private trip around The bits we missed on the hop on hop on bus. Although Raffles is still closed the Long Bar for Singapore Slings is still open and nuts. Worth a visit. We were there two days and three would have been perfect. Our trip was to follow Gills parents pioneering trips of the 50s on there way to work in Aus so we were trying to stay at Raffles. Lucky for us still closed. Next time we visit Singapore tough call. Fullerton or Raffles. My vote would be the Fullerton. I would give this hotel and staff seven stars and will always be grateful to them for making our visit extra special. Final bit always need a decent shower after a busy day especially with temps in the 30s. Again the Fullerton deliver plus good sized rooms. Thank you for taking the time to share your recent stay experience with us. We are delighted to receive your feedback and it's always a joy to know that you enjoyed your stay at The Fullerton Hotel - from the room to the facilities, to the food as well as services and lastly the location of the hotel. We truly appreciate your kind words on the hotel and we look forward to welcoming you back in the near future! Thank you for choosing The Lighthouse to be part of your anniversary celebration. It is a joy to know that you had a memorable dinner with us and we'll be sure to convey your message to Khalid. Well what can I say about this beautiful hotel? Weâ€™ve stayed in some of the most beautiful and iconic hotels around the world and as such had high expectations for our stay here. We certainly werenâ€™t disappointed. From the moment we arrived we were treated like royalty. We were personally escorted to our room and given a brief tour of the hotel. The hotel is out of this world, the perfect Singapore location with magnificent views of marina bay but also such beautiful heritage as the old GPO offices. I would highly recommend the heritage tour from the Fullertonâ€™s sister hotel Fullerton Bay. Very informative and interesting. The hotel is full of fabulous bars and restaurants including the rooftop bars and we had great pleasure working our way through the cocktail menu. Jade Restaurant is also fabulous. There is the beautiful Fullerton Spa and the infinity pool both open to guests. I have to give a special mention to Gladys ObaÃ±a, the Assistant Guest Services Manager at Fullerton Hotel. She went totally above and beyond our expectations both before and during our stay. Our only disappointment was that we didnâ€™t stay longer, however we will definitely be back. Thank you for taking the time to review your recent stay experience at The Fullerton Hotel Singapore. We are truly happy to know that we have surpassed your expectations in all aspects of our hotel facilities, products and service delivery for you. We are grateful for your kind compliments and we'll be sure to convey your message to Gladys Obana at the Front Desk. We are also happy to know that you enjoyed the Heritage guided tour and find it informative and interesting. We look forward to welcoming you back soon! There are many good hotels in Singapore, and the Fullerton may not even be the best, but it is certainly my favourite. Just shews what you can do with a redundant Post Office in the centre of town. Many rooms have stunning views and all are comfortable, the breakfast stations cater to every national taste, the infinity type pool is convenient and the location is perfect. Staff are pleasant and properly trained, and if you save up, or spot the deals, it is just about affordable.